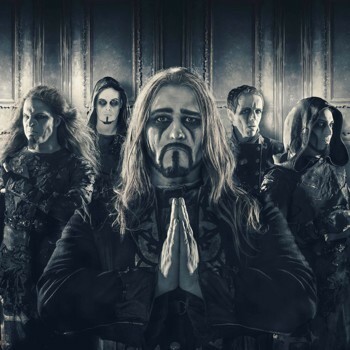 On a Monday night at the KOKO in London was a full-house crowd who waited patiently for the Metal mass of Germany's Powerwolf to take to the stage for their final UK sermon of 2018. To kick the evening off in style, the house lights went down and the red glow of the TNT began to light up the stage for German rockers Kissin' Dynamite who got the crowd jumping with 'I've Got The Fire', the first track of the new album 'Ecstasy'. With Hannes Braun's deep and powerful vocals, we all felt the explosion from the last night of their first UK tour. As part of their ethos to "Bring Back Stadium Rock", 'Somebody's Got To Do It' had very familiar traits of the Hair Metal LA stadium scene of the eighties. The set then returned to a few earlier album classics of 'Highlight Zone' and 'Love Me, Hate Me', before they returned back to the current album and got the crowd going again with 'Waging War' and 'You're Not Alone'. To round the set off in royal style, the band opted for 'I Will Be King' and 'Flying Colours'. This was my first time seeing Kissin' Dynamite and it won't be my last. There was a quick turn-around for special guests Amaranthe. It was so nice to have them back in the UK with their new studio album 'Helix'. The crowd once again was jumping and cheering the Swedish Heavy Modern Metal five-piece who sport the somewhat unique three-vocal line-up of Nils Molin, Henrik Englund Wilhelmsson and Elize Ryd. The set was a real treat for the ears and the eyes, with songs from the new album as well as some popular older tracks. '365', with its heavy riff, really got a good circle pit going, while '1,000,000 Light Years' saw Elize Ryd with the crowd in the palm of her hand. Following Amaranthe's lively and bombastic set, the lights eventually went out again, the crowd roared and the Power Metallers from Powerwolf arrived on stage to give a lengthy set of classics and new material. Attila Dorn kicked off the service with 'Fire And Forgive', before he guided the faithful through a powerful set with greats such as 'Demons Are A Girl's Best Friend', 'Killers With The Cross' and 'We Drink Your Blood'. It was such a great show that words can't really do it justice – seeing and hearing is believing! Powerwolf do live shows the only way German's know how to, hard and heavy. So, don't miss them when they are back in the UK for more dates in early 2019, I know I won't!